IEMMF coming again in 2016! Inland Empire Mini Maker Faire 2014 was an uplifting success! Even though there has been lots of requests for an IE Mini Maker Faire 2015, we will be sticking with the original plan of supporting the OC Mini Maker Faire 2015 and look forward to having the IE Faire again in 2016. Please LIKE the OC Mini Maker Faire page. And check it out… their call for Makers is now open! Throughout 2015 let’s keep building and connecting the Maker community in the IE so we can have an outstanding event next year. If YOU want to get involved in making the Inland Empire Mini Maker Faire 2016 happen, join our Meetup group! Complete list of Makers, exhibitors, and vendors for IEMMF 2014! Announcing the complete list of makers/exhibitors for the first-ever Inland Empire Mini Maker Faire! Raptosaur 3D Printer by Custom Data Systems, Inc. The Riverside Robotics Society is a branch of the Southern California Robotics Society, an organization that was created to promote robotics in every way. Their monthly meetings include classes on robotics, tips and pointers, contests, show and tell, and they are open to people over the age of 10. (Those under 18 must have parent present.) Their members (almost 400 and counting!) create everything from miniature “bug bots” to full-scale human-size robots. They have members present at the Inland Empire Mini Maker Faire who will be exhibiting some of their fantastic robots. We also hope you will check out their October 11th event – The Riverside Robot Expo and Star Wars Reads Day! Meet the Makers: 3Rs Robotics! 3Rs Robotics designs curriculum to teach students the basic and necessary skills to thrive in the broad fields of science, technology, engineering and mathematics. Their captivating lesson plans illustrate the fundamentals of planning, design and programming along multimedia avenues. With a focus on the importance of collaboration, the projects are entertaining and engaging, leaving students enthusiastic about learning challenging and relevant material. Their curriculum is made to be accessible to anyone, whether or not you have any knowledge or experience with computers, robotics or electronics. To prepare educators they offer live, interactive instructor, training that will teach you how to implement the course material in a single day. Along with creating enticing curriculum, they also host STEAM (Science, Technology, Engineering, Art, Math) tours at schools and educational venues via hands-on workshops. 3Rs Robotics believes real science education should be obtainable by everybody. On October 4th, you can experience 3Rs Robotics’ science and technology education kits hands-on at Inland Empire Mini Maker Faire from 10AM to 6PM! FIRST Robotics team Robokong with mentor, Rick Sisk. FIRST Robotics team, Robokong (team #2493) is a community team of 10-20 kids between the ages of 13-18. Every January the team spends 6 weeks building a 150 lbs, 5ft tall robot to compete with other teams from around the world in a robotics event designed to challenge the team’s engineering, strategy, and teamwork abilities. Students learn how to build a robot in a real world situation. Time and resources are in short supply, the challenge is tough and the team often needs to make critical design decisions in order to complete a competitive robot. In addition to the annual competitions Robokong participate in, they also reach out to the community to engage and inspire others in the areas of science and technology. Robokong sponsors a team of 8-14 kids who build robots using Lego Mindstorms. They teach the kids the skills they need to analyze game challenges, design and build robots, and program the robots to autonomously complete challenges on a 4x8ft field. They took on a new challenge this year by forming a Battle Bots team. Unlike their FIRST Robotics team where they work cooperatively with other teams to complete a goal, Battle Bots are designed to damage and destroy other robots. Their battle bots team is COMPLETELY student run. The captain, Jake Haynie, is responsible for coordinating the teams efforts and leading the robot design and construction of the robot. FIRST Robotics programs are a great way for kids to get hands on, project-based learning experience in a fun and exciting environment. Students learn real world skills that help them in school and after. They learn that decisions have consequences and those decisions can be the difference between victory on the competition field, or a robot that performs poorly. They learn that hard work and perseverance will take them further than excuses and giving up. Robokong will be competing at the 2015 Inland Empire Regional at Rancho Mirage High School, Feb 28-Mar 1. They currently have students from King, Poly, Santiago high schools, and are sponsored by Boeing, Vocademy, Rest Assured Mortuary, STARS for a Better Tomorrow, ACE Metals, and Gethsemane Lutheran Church. Come check them out at the Inland Empire Mini Maker Faire on Saturday, October 4th from 10AM to 6PM! Why do educators love Maker Faire? Why do educators love Maker Faires and Mini Maker Faires? Check out this post from MAKE magazine on how educators, in their own words, have benefited from the faires (also includes tips for educators by educators for prepping and navigating the event). Also check out this video to see a small piece of the fun, educational exhibits that are presented at the faires. Tickets for the Inland Empire Mini Maker Faire are available online, or if paying in cash call 951.266.6630 or 951.275.5350. Riverside Live Steamers (RLS) began in the 1950s in an effort to preserve the experience of steam locomotion… in miniature form! In part an effort by the City of Riverside, but largely through the love and hours put in by volunteers, the RLS makes the experience of steam trains available to approximately 18,000 – 20,000 passengers every year. For more information about the Riverside Live Steamers, check out their website. Come see the Riverside Live Steamers at the Inland Empire Mini Maker Faire on October 4th. Tickets on sale now! Electric Giraffe with maker, Lindsay Lawler, at the White House Maker Faire. Come talk to Rave ‘Raffe and Lindsay at the Inland Empire Mini Maker Faire on October 4th, 2014! Electric Giraffe, aka Rave ‘Raffe, and his Maker friend Lindsay Lawler will be attending the Inland Empire Mini Maker Faire! Come meet AND TALK to Electric Giraffe. Yes, you read that right… give the 17 foot tall ‘Raffe a nice pat in one of the sensor “petting zones” and he will talk and interact with you! Want to learn more about the technical aspects of the Electric Giraffe? You can check out his website for plenty of in-progress images and technical descriptions, and come equipped with questions to ask Lindsay at the Inland Empire Mini Maker Faire on October 4th! Call for Makers open NOW! “Maker Faire is interactive and educational in all kinds of ways. Maker Faire is not a passive sit-down experience; it’s a hands-on experience that you grab hold of. From simple conversations and detailed explanations to amazing do-it-yourself demonstrations, Maker Faire is all about participation and sharing. Many Makers develop exhibits with hands-on activities. Others bring unusual objects that we don’t see everyday. Maker Faire rewards curiosity. We get to learn how things work, and why. We get to try new things and understand that we can expand our own capabilities. We consider the process of making as important as the perfect, finished product. Sharing the process with others creates new opportunities for learning.” Courtesy of Maker Media, Inc. 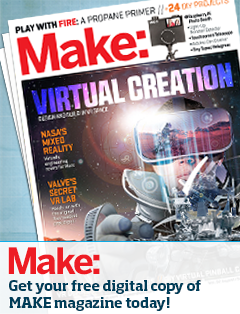 CALL FOR MAKERS CLOSES ON SEPTEMBER 19th! Sign up for the newsletter, and join our meet-up group. 2014 Inland Empire Mini Maker Faire is coming! Riverside California, 2014…Vocademy – The Makerspace is proud to be hosting the 1st Inland Empire Mini Maker Faire on Saturday, October 4th at 1635 Spruce Street (near the corner of Chicago Avenue) in the City of Riverside. Maker Faire is an all day, family-friendly showcase of invention, creativity and resourcefulness, and a celebration of the Maker Movement. It’s a place where people show what they are making, and share what they are learning. A perfect family event with interactive activities for all ages and the first of it’s kind in the Inland Empire! Makers range from tech enthusiasts, to students to crafters to homesteaders to scientists to garage tinkerers and many more. They are of all ages and backgrounds. The aim of Maker Faire is to entertain, inform, connect and grow this community. Makers will demonstrate and exhibit their creative work in science, technology, invention and the arts. We are working to bring together upwards of a hundred exhibitors and are looking for your suggestions. Visitors can expect to see 3-D printers, CNC technology, robotics; quad copters with cameras; toy and electronic musical instrument hacking; science demos; liquid nitrogen smashing of fruits; engineering clubs, steampunk creations, , and many more! Our exhibitors will focus on creative applications of technology, the arts and sciences. WE NEED YOU! Mini Maker Faires are only possible with dedicated volunteers, exhibitors and sponsors! We welcome you as an individual, a local organization, a club, your company, your school, and local governments. Please use the buttons on the right and sign up, and help us spread the word! Vocademy – The Makerspace is “the place to learn and make anything!”. It is open 7 days a week, from 11am to 11pm and tours are free. Located at 1635 Spruce Street, in Riverside. There is ample parking and is conveniently located less than a mile from UCR and Downtown Riverside. Contact Vocademy at 951.266-6630 or www.VOCADEMY.com for more information and/or free tours or classes. Inland Empire Mini Maker Faire is independently organized and operated under license from Maker Media, Inc.